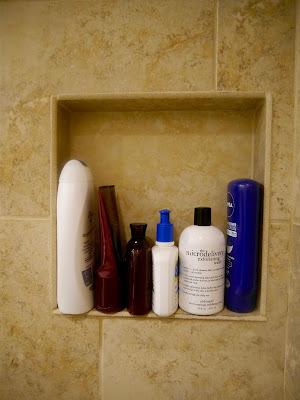 When I looked at the shower niche that contains my beauty products, it drove me crazy. The product bottles were all different shapes and sizes and some bottles overhung the ledge. What I wanted was matching bottles that properly fit into the space. I found a very inexpensive solution at the beauty supply store where these soft, clear plastic bottles are sold for only 99 cents each. 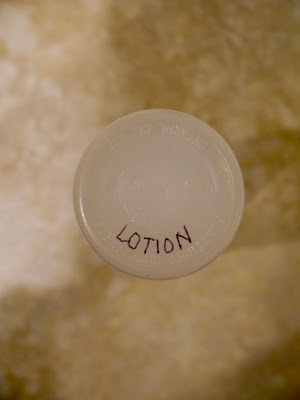 Before decanting products into them, I used a permanent marker to label the bottom of each bottle. 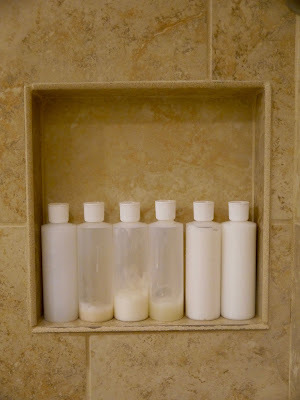 Voila, now I have a serene-looking shower niche!